New restaurant looks to branch out near popular intown center. Addison, Texas-based Fiesta Restaurant Group Inc. is planning a second location of its newest concept, "Cabana Grill," at Toco Hill. The restaurant would be built on the wooded parcel in front of Kroger, adjacent to the AAA Auto Care Center. The parcel once had an old white house on it, but the house was demolished many years ago. The parcel is owned by Bennett-Johnson Properties, LLP, descendants of the woman who lived in the former house. W. Clyde Shepherd III of Toco Hill Inc. has sought for many years to purchase the parcel and apparently his offer was lower than the family thinks the property is worth. Toco Hill Shopping Center was developed in 1956 by William Clyde Shepherd Jr. Shepherd III has reportedly refused to allow curb cuts from the parcel to Toco Hill Shopping Center, meaning that access to and from the restaurant would be exclusively via LaVista Road. As it stands now, the most significant hurdle to getting the restaurant built is a large and old white oak tree near the center of the property. Any clearing of the land would necessitate removal of the tree. 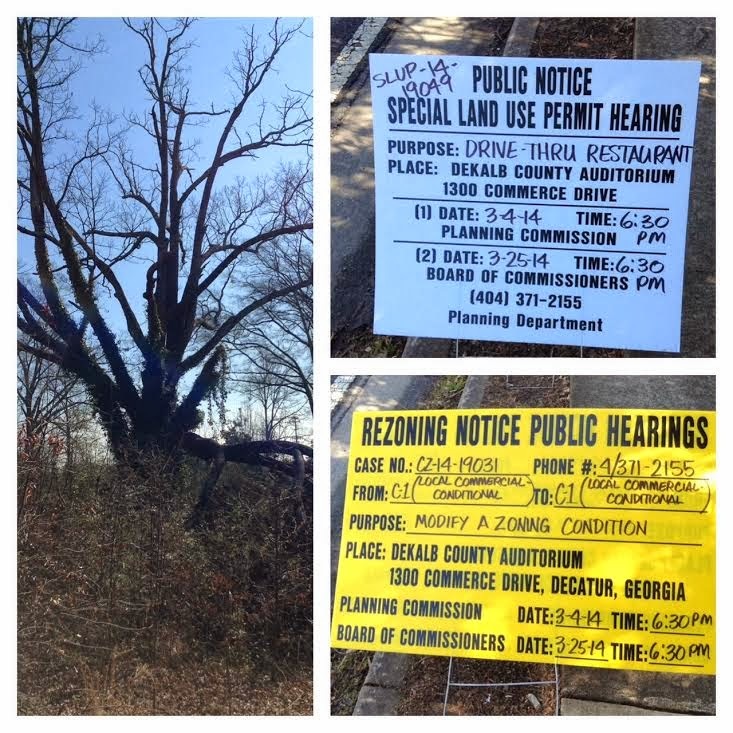 Due to the age of the tree, a special request would have to be made at a scheduled DeKalb County Department of Planning & Sustainability Commission hearing. The request, labeled "Major modification to remove a condition of CZ-03-046 that requires preservation of a mature oak tree on a C-1 (Local Commercial) property" will be heard March 4th by the Planning Commission and March 25th by the Board of Commissioners. I grew up in Toco Hills, I watched as Blockbuster (now AAA), Chili's, Outback Steakhouse, Pike Family Nurseries and Bruster's were built. During this time, the parcel in question has remained vacant and a bit of an eyesore. It's amazing it has taken this long for a deal to come close to happening. "Cabana Grill A Taste of Mexico" is described as similar to Taco Cabana but with a slight step up. Cabana Grill will serve both lunch and dinner, and feature an all important drive-thru at its roughly 3000 square foot freestanding building, an outparcel of the existing Kroger-anchored shopping center on LaVista Road. The restaurant would also feature a roughly 1000 square foot patio. Described by a company executive as a "hybrid approach" Cabana Grill seems to be a "flex casual" format, something tested but abandoned by its sister concept, Pollo Tropical. In this scenario, customers will queue up for the cashier to take their orders and then sit down with a table number, waiting for their food to be delivered to them. Cabana Grill's food is casual and approachable, but still fresh and made to order. Guest checks are expected to be in the $8-10 range with offerings like burritos, fajitas, nachos, quesadillas as well as various scratch-made salsas and a variety of sides . Plans call for Cabana Grill to feature a full drink menu and liquor license to offer house made margaritas for those dining in. 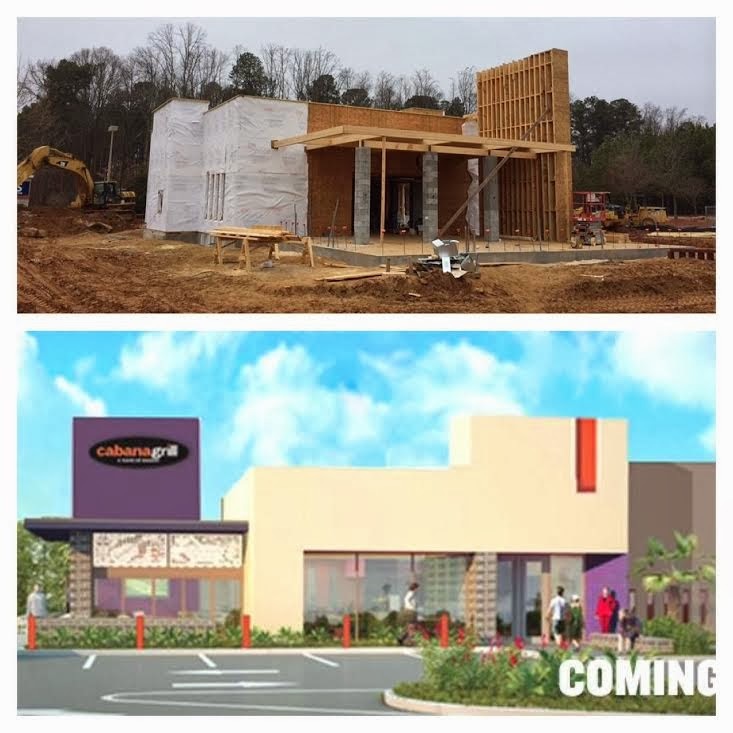 The first ever Cabana Grill will open on Scenic Highway in Snellville. The restaurant, in an outparcel of the existing Lowe's Home Improvement is reportedly on track to open in late March or early April. Another Cabana Grill is in the works to open in Jacksonville, Florida late this year. Fiesta Restaurant Group was created in 2012 when its former parent company, Syracuse, New York-based Carrols Restaurant Group, spun off both Taco Cabana and Pollo Tropical. Atlanta's only Taco Cabana closed last year. The restaurant, located on Piedmont Avenue near Cheshire Bridge Road, had been a landmark for years, but allegedly was run by a "rogue" franchisee who rebranded the restaurant Mama's Cocina Latina. No longer affiliated with Taco Cabana, Mama's Cocina serves a very similar menu and remains open 24 hours. There are currently five Pollo Tropical restaurants in metro Atlanta. The chain had three franchised locations in Atlanta in the mid 90s, but they closed amid lower than expected financial results. Ironically, one of the original Pollo Tropical restaurants in Atlanta was at Toco Hills, where Einstein Bros. Bagels is today. Pollo Tropical's reentry to the Atlanta market, which began in 2011, has reportedly been largely well received. Did you grow up in or around Toco Hills? What are your thoughts on this planned redevelopment? What is your oldest memory of Toco Hills? I don't call a 300+ year old white oak tree an eyesore. I call it a treasure. The neighborhood has tried for years to get that piece of property used as a park space in order to preserve the tree and make the area more useful. I totally agree with MMartin. I've always enjoyed the green space there with mature trees. I grew up and have lived in the area since the 1950's. I drive past that site almost every day, for one reason or another. The old oak in the center is magnificent, and the big trees around the board are impressive, too. My usual thought on passing by is "Thank goodness we have a little bit or beauty to break up the monotony of commercial development and parking lot that stretches from LaVista to Clairmont. This greenspace works overtime to keep the expanses surrounding it from being a total eyesore. I agree with the other comments - I was sad when the old white house was suddenly gone one day (a few years ago, as you said) but I liked it there. I wish it would be a park or something. Toco Hills doesn't need another Mexican Restaurant. La Parilla and Chipotle are already right there. While I wouldn't mind seeing a Cabana Grill somewhere in the Druid Hills area, I don't think Toco Hills is the right place for it. The tree itself is huge. One needs to get close to it to appreciate its scale. The unkempt lot it sits on does nothing to add to its beauty. The county does have Code Enforcement requirements that are likely being violated in that regard. But Code Enforcement is a reactive not proactive entity. In other words "If you don't complain, they don't act." Yes, some greenspace there would be a nice interlude to the hubbub of Toco Hill Shopping Center. Now let's get our terminology straight. Toco Hill (Singular", being a contraction of "Top of the County" contains Kroger and exends around the corner. Toco Hills (Plural) is the contiguous extension that contains Publix. And I believe they have wholly separate owners. Be that as it may, installing another "Semi-Fast Food" joint in that spot would be a desecration of the ancient tree that stands there. While hollowed out it's probably been on the verge of dying longer than most of us have been alive. I can't imagine the things it's seen. Sad too was the loss of the house that occupied the site. But it had become a haven for the usual ne'r-do-wells that espy an abandoned abode. And, we must ask ourselves — Do we really need another drive up window that serves food that calls itself "Mexican" but would not be recognized as such by many self respecting Mexicanos. I say "No". I would think this to a good use of 'eminent domain'. If for nothing else, respect for our elders, even if that elder cannot speak for itself. "But code Enforcement is a reactive not proactive entity. In other words, if you don't complain, they don't act." Even when we DO complain, they often act very, very slowly slowly, if at all. This is yet another reason why we need a new city of Lakeside. That parcel is the only thing offsetting that giant cinder block that is the AT&T building. KEEP the tree!!!!! The greenspace is a nice break from the commercial concrete that surrounds it. We don't need aanother restaurant. We had a Pollo Loco on the site where Einstein Bagels is currently located and it didn't survive. How about a park for kids? A park? I wouldn't want to take my kids or go relax at a park in a Kroger parking lot next to a busy road. I think the landowner should have the right to remove the tree if they'd like to. I love trees and parks, too, but if you owned land in a decidedly commercial area would you give up the potential $100k+ annual ground lease revenue to make it a park? The lot is an eyesore. Cleaning up the lot with nice new development and fresh landscaping will improve the area. The idea of a park in front of a Kroger is ridiculous. The value of this lot is woth acres of green space elsewhere and we already have parks within walking distance. Dekalb County needs tax revenue. Dekalb county schools need property tax revenue for our schools. My teenager and many other area residents could use a job that he could walk to. I want to spend Cinco de Mayo 2015 at our new Cabana Grille.